The Specter Gear Long Gun Retention Lanyard provides many of the benefits and features of a One Point Sling while at the same time limiting interference with other equipment to the lowest degree possible. 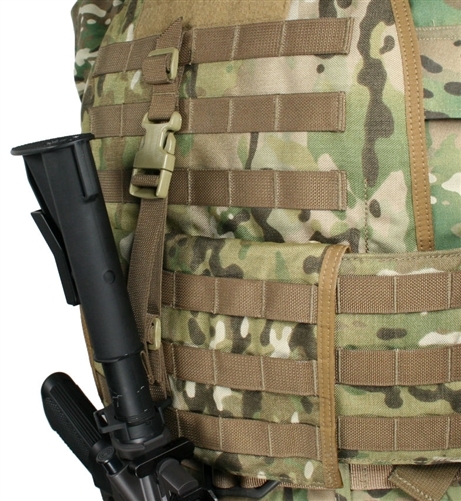 The Long Gun Retention Lanyard will mount to modular webbing, D rings or any other hard point on your load bearing vest, harness or carrier that will accept 1” wide webbing. The Long Gun Retention Lanyard is constructed from 1" wide Mil-W-43668 webbing and features a heavy duty side release buckle. All stress points are bar tacked for maximum durability. As with all of our products, this item is made in the USA using only top quality materials and manufacturing procedures.